Favourite Ground: Fr. Healey Park, Loughgiel. Player You Admire Most: Henry Shefflin (Kilkenny). Most Difficult Opponent: Mark Keane (Limerick) / Kevin Brodrick (Galway). Advice to Young Players: Hurling is not just a summer game. To be the best you can, you have to practice all year round. 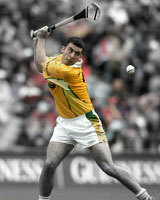 Ambition: To win Club Senior Hurling Championship and to be competitive at county level with the Cork's and Kilkenny's. County - 1 Ulster Championship, 1 Christy Ring Cup.